Fondly known as the Leopard Man of India, Giri Cavale has spent years researching big cat behaviour on field. To say that wildlife photography is having its moment in India would be an understatement. Affordable cameras, better lenses, the ease of access to India’s top national parks, and, of course, the iconic species our country is home to, have all helped shape this trend. Perhaps this is truest of Bangalore, India’s unofficial ‘wildlife capital’. The city is strategically located to some of the most well known national parks and tiger reserves, and it has bred a growing number of nature enthusiasts and photographers. It’s no surprise, then, that one of India’s finest nature photographers, Giri Cavale, has also emerged from this fertile ground. Fondly known as the Leopard Man of India, Cavale has produced some of the most striking images of elusive big cats in our country. One of his most recognisable photographs is of an elegant leopard on a tree, poised in a way that would make supermodels proud. 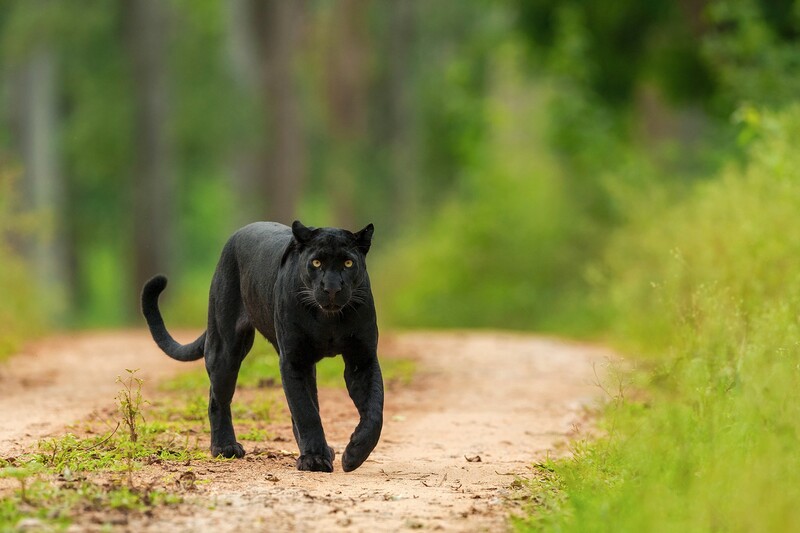 Cavale was among the first few photographers in the country to have photographed the melanistic leopard, as researched documentation, long before it became a fad or a bucket list frame. Cavale has picked up a swathe of prestigious accolades, including a gold medal at the 17th Nature Biennial World Cup by the International Federation of Photographic Art (FIAP), 2014, and the 2nd prize at the Sanctuary Wildlife Photography Awards, 2013. 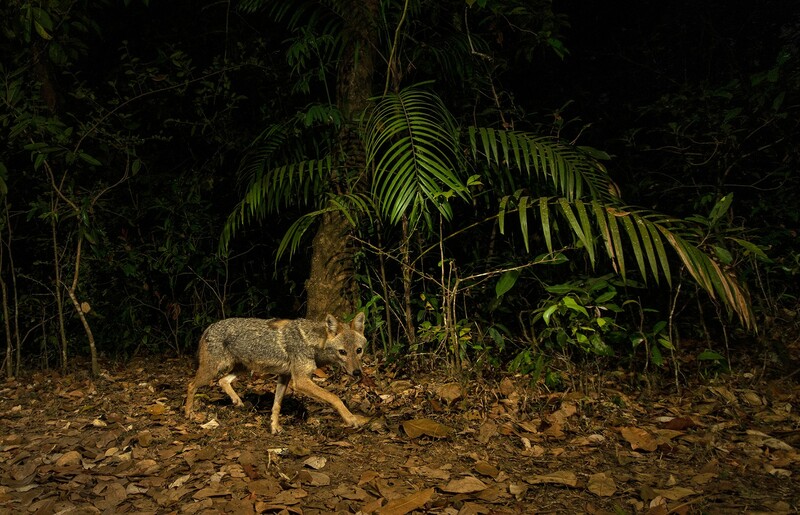 Currently, he is breaking new ground with his pioneering camera trap images, while also helping young photographers hone their skills on photo tours, through his company LensOwl. Now, we turn our lens on him. 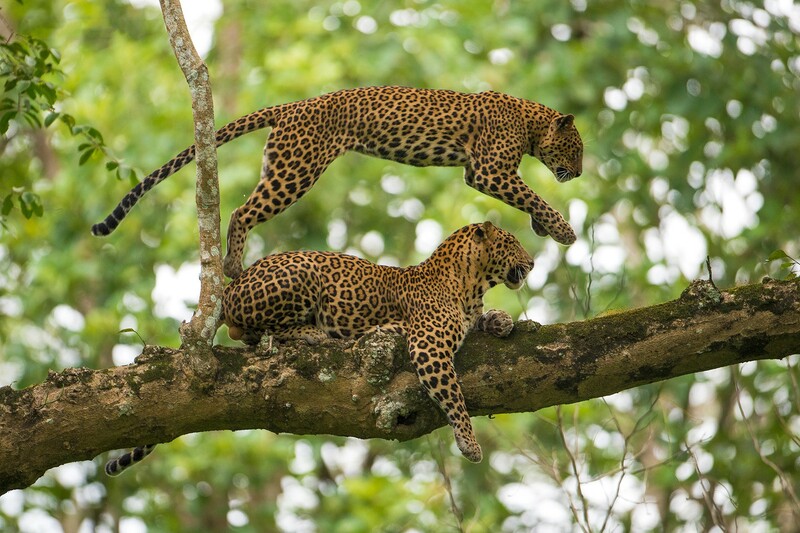 One of your most iconic images is that of a leopardess leaping over her mate. Over a 12 year-long career, you have managed some beautiful images of this elusive, unpredictable animal. How do you track big cats and photograph them in these unique ways? Yes, there is a fair bit of knowledge and tracking involved before you photograph the animal. I only observed wildlife and tried to study their behavioral patterns for many years. My first visit to a wildlife reserve (Nagarahole National Park) was in 1984; I was seven. I first picked up a camera in 1997, but have only really focused on photography since 2005. For all the years in between, I was in wild spaces without a camera in hand. I learned that each of these big cats have territories, and that knowledge turns out to be a big advantage. If you have two safaris planned in one day, and you see a particular tiger or leopard at one spot in the morning, you can predict where these cats are likely to be in the evening. In my experience, the accuracy of such predictions is within the range of 60-70 percent. And as you observe them, you start to understand the individual cat, and what he or she is likely to do. Also, they are rather curious and often end up looking directly at big lenses or at people’s movement in a particular vehicle, so that’s how you end up getting eye contact in your image. The iconic image that won Cavale the second prize at the Sanctuary Wildlife Photography Awards, 2013. 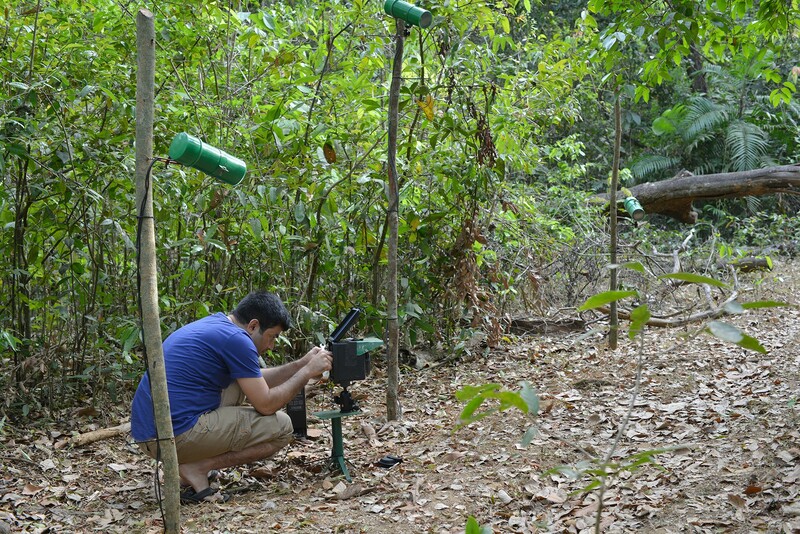 You were among the first few proponents of using camera traps for wildlife photography here in India. Did you face problems with this form, then? Camera trap photography is highly specialised – apart from access, you need time, skills to use the technology… it’s not like picking up a camera and then going on a safari. 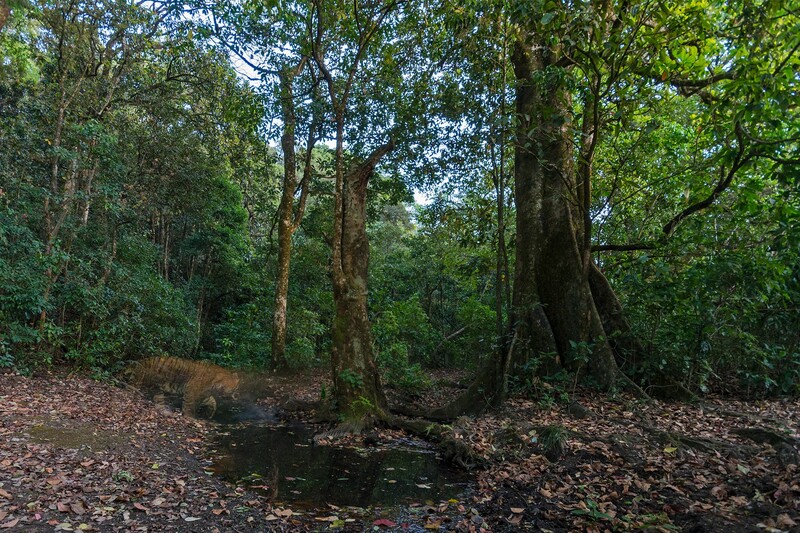 The most important thing is that you need permissions from the forest department to undertake such exercises – irrespective of whether it is a protected area or reserve forest. I ventured into camera-trap photography back in 2009, in Bera, Rajasthan where I was successful in getting images of wildlife such as leopards and hyenas. One of the biggest challenges I faced at that time was the technology itself, because back then, very few people were experienced in this form of photography; we were just not familiar with the process. Online reading yields bits and pieces of information. But there were several things I didn’t know: how to trigger the flash, where to place it, how to protect the equipment in adverse weather conditions. It took me a couple of years to figure this out. Right now, when I set up camera traps, they work for almost a month; I don’t have to go change batteries every other day. This means there’s minimum disturbance to the site. Of course, there are risks and expenses. I have lost a couple of camera traps that were trampled by elephants (so now I’ve now installed a metal enclosure instead of the Pelican Case I employed earlier). How are other technologies like Go-Pros and drones changing the field of wildlife photography? Any form of unmanned photography requires permissions, which remains a difficult task. Drones often require clearances from multiple agencies here in India – you can’t just fly a drone anywhere in a national park. Apart from security reasons, many departments are a bit skeptical about giving permissions because there is a possibility that unmanned equipment may cause damage. However, GoPros can be used reasonably safely, mounted on a vehicle or a stick. Going forward, I do see these technologies playing a greater role in the field. In 2016, one of the winners of the BBC Wildlife Photographer of the Year awards took his photograph using a GoPro, not a DSLR. The format should not be a hindrance to creating an image; it depends rather on your creativity and how well you use the equipment. "The format should not be a hindrance to creating an image; it depends rather on your creativity and how well you use the equipment." What’s your view on the growing number of camera-wielding (DSLR, phones) nature enthusiasts in India? Is it making photography a more democratic space, or just a more cluttered one? Things have definitely changed since the digital revolution in cameras. When I started out, I was using a film camera, and when I started venturing out into forests, if there were 50 people in one hotel, perhaps five of them would have cameras. The rest were wildlife enthusiasts or regular tourists keen to just see the animals. I would say that the equation is now completely reversed – today, 45 of them would be clicking photos on safari one way or another. This is what the digital era has done to photography. The point isn't just to go on safari and take photos when you’re in a tiger reserve, because you’re not doing anything different. People seated in 10 different vehicles in a particular spot are all likely to come back with similar images. That’s why it’s important to keep exploring different possibilities to create striking frames, otherwise you are just one among the crowd. The creativity of the photographer, now more than ever before, is one of the most important aspects to differentiate one’s work. One of Cavale's favourite images made using a camera trap, which he calls the 'Vanishing Tiger'; the motion blur making this a fitting title. In your experience as part of the tourism industry, do you think this helps local communities that live around wild spaces? It’s tough for me to comment on this, but I would say that people living around national parks are benefitted by tourism – they do gain employment through various means, as a driver, a cook, a naturalist, and so on. Most hotels prefer to hire locally. I have noticed that with so many photographers visiting reserves, safari jeep drivers have become increasingly well versed with cameras, too! I think it works out well for all the people involved. Giri Cavale showcased his work at the Nature inFocus festival, 2017. If you missed it, or would like to listen to his experiences and learnings from tracking big cats, here it is.